Best Baked Macaroni Cheese Recipe Ever! This is the best baked macaroni cheese recipe ever, and my kids love it on weeknights and also on special occasions. In fact it is also one of our favorite Thanksgiving recipes. The secret to this recipe is the cheese sauce. If you don't get that right, then the recipe will not turn out well. There is some technique involved in making a good cheese sauce. That's why I've written a whole page for my husband's cheese sauce recipe, explaining the tips and tricks he's learned for making a consistenly good, not gloppy, cheese sauce. Once you know how to make the sauce the recipe itself is really quite simple. Here it is, along with directions for the best baked macaroni cheese recipe you will ever make. You can make any type of cheese sauce for this recipe, with any mix of cheeses that you and your family like, but this is the one we like the best. Boil your macaroni while you make your cheese sauce. You want to time it where the sauce and macaroni are done at about the same time, so your cheese sauce does not have to sit very long once complete. Next, pour your cheese sauce onto it and mix the macaroni and cheese sauce together. Finally, sprinkle your cheddar cheese on top, which as it cooks will give this southern baked macaroni cheese recipe a nice brown crunchy layer, and place in a preheated 400° oven for 20-30 minutes. 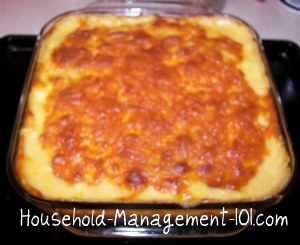 You will know your homemade baked macaroni and cheese is done because it will turn golden brown on top. Extra hint: The pan gets pretty full of cheese sauce and macaroni, so we always place it on a lipped cookie sheet when we place it in the oven. Then, if any boils over it drips onto the pan and doesn't make a mess in your oven. Let it cool for 10 minutes or so (but it will still be quite hot when you spoon into it, so be careful) and serve. Both you and your kids will really enjoy it. I guarantee!